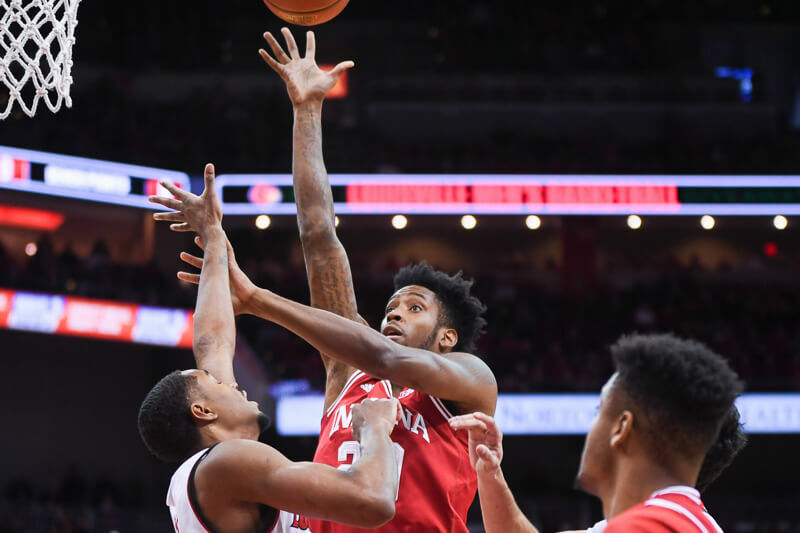 How it happened: Indiana started strong in the KFC Yum! Center on Saturday afternoon. The Hoosiers sprinted out to a 10-point first half lead on the strength of hot shooting and second-chance points. Louisville, meanwhile, struggled to find its footing as its crowd grew restless. But as you’d expect from an experienced team playing in their own building, Louisville made a run in the latter part of the first half to close the gap to one at halftime. Freshman Malik Williams was a big reason for that as he splashed a trio of 3-pointers, many of which were uncontested. 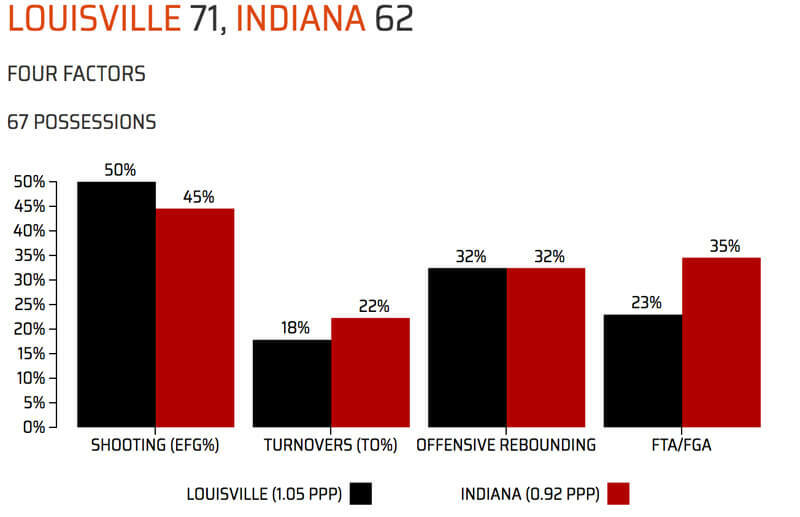 The Hoosiers kept it close for a good part of the second half, but an inability to convert from the perimeter was ultimately their undoing. Indiana shot a dismal 0-of-12 on 3s in the second half and Robert Johnson, who shot 0-of-4 from distance, didn’t score in the game. The loss drops the Hoosiers to 5-5 and they’ll have a week to regroup before taking on Notre Dame next weekend in Indianapolis. Standout performer: Juwan Morgan continued his strong junior campaign with a team-high 17 points and nine rebounds in 23 minutes. Statistic that stands out: Indiana’s second half shooting was a killer as the Hoosiers hit just 10-of-28 from the field. In what way? It was straight forward. DG has started before but obviously isn’t ready for that task or Archie would be starting him. RJ, despite his offensive presence is the only stable guard on the floor, particularly on D.
Archie is developing a culture of “bring it in practice bring it in the game” and he has proclaimed that from day one. You’re asking him to: go against his culture; sacrifice the play of others on the team; probably sacrifice other intangibles such as wins/losses team chemistry and other stuff to cultivate one player. Sorry, my man, that’s not how it works. I read this on here all the time. Basically, I see it as both a failure to have played a great deal of organized basketball and the idea (unproven) that somehow someone develops by repeating the same mistakes over and over again. It’s absolutely true that you “play what you practice.” There is no way of getting around it. Even MJ, and DG is obviously no MJ, learned basic fundamentals which enhanced his God-given natural talent. Agreed. There are plenty of guys on the bench who will “try hard, play tough defense and hustle all while being no threat to score” such as McRoberts, Priller, and basically everyone who doesn’t usually get in. Can you read.. I watch the games. just not live at this point.. especially when you know they won’t win.. I love the way you guys cheering outlooks equate to wins…. oh that’s right it doesnt. It was always a decision CuJo could make. He didn’t get minutes presumably because he didn’t EARN minutes. Unless something else political was going on, a player earns his minutes with effort and ability. Good points made on both sides of this conversation. I believe you play what you practice as well. But repeating the same mistakes is something that appears to also plague Johnson (poor shooting and questionable form, not driving/getting fouled when shots aren’t falling, etc. ), Newkirk (many bad habits, TOs and inconsistent shooting form, etc.) and others. None of these guys are perfect, and there is a point to be made for looking to the future. If Johnson isn’t cutting it IU may want to look at who is on the bench that may be important contributors in years to come. They need minutes and in-game experience too. Alex addresses this much more succinctly in the forum; wish you could read it. Basically, this “development idea” would setback if not destroy what Archie is building. Also, it’s a cliche that somehow a player develops better habits from playing or develops his talent from playing. No, that doesn’t happen or rarely happens. That’s AAU ball and AAU thinking. It would do those players and IU’s program no favors. The forum is tempting! I don’t believe players develop better habits or talent by playing rather than practicing, and never said as much. You develop skills by practicing them, but also by employing them in real game situations. In-game is where you develop the confidence to do the things you practiced. So I believe there is a lot of value for players in actually playing meaningful minutes to hone skills for the future. Yes they have to be playing “correctly” if you will, not falling back to bad habits. As to how developing players would affect Archie, that is something to consider. I mentioned elsewhere that many “fans” would abandon ship if it appeared Archie “gave up” on this season. Bottom line is do we really think this isn’t a development season? I know some thought this year was a Sweet 16 or Final Four at minimum, but realistically most of us knew this is a transition and development year. Why not treat it like one?